From blues rhythm guitar to soloing, this book will help you learn in a step by step manner to play blues guitar styles similar to greats such as Stevie Ray Vaughn, BB King, Eric Clapton and others. You will learn the different techniques used in playing blues guitar and how to combine these elements to create your own blues solos and rhythm parts. 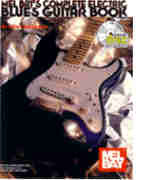 The book contains sections on the blues progression, comping, power chords, turn-arounds, blues fills, scales, double stops, common blues licks, use of the whammy bar, how to get a blues sound, and how to build a blues guitar solo. The text is written in notation and tablature. This set includes a stereo play-along CD and 110-minute DVD.